Free Sample of Nestle’s Nesquik! 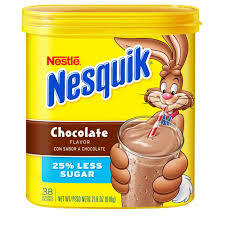 Click here to snag a free sample of Nesquik! Sample pack includes five (5) NESTLÉ® NESQUIK® stick packs and a coupon to save $1.50 on your next purchase of any size, any flavor of NESTLÉ® NESQUIK® powder. Offer good in the US only. Offer valid only while supplies last. Limit one (1) sample pack per household or address. Please allow 6 – 8 weeks for delivery. https://i2.wp.com/savvywifehappylife.com/wp-content/uploads/2014/07/download-1.jpg?fit=225%2C225&ssl=1 225 225 Brandi https://savvywifehappylife.com/wp-content/uploads/2016/09/SavvyWifeHappyLife-logo-2.png Brandi2014-07-14 16:35:092014-07-14 16:35:09Free Sample of Nestle's Nesquik!